when drew came up to bat in the 7th inning last night, the previous 3 red sox had just hit home runs. 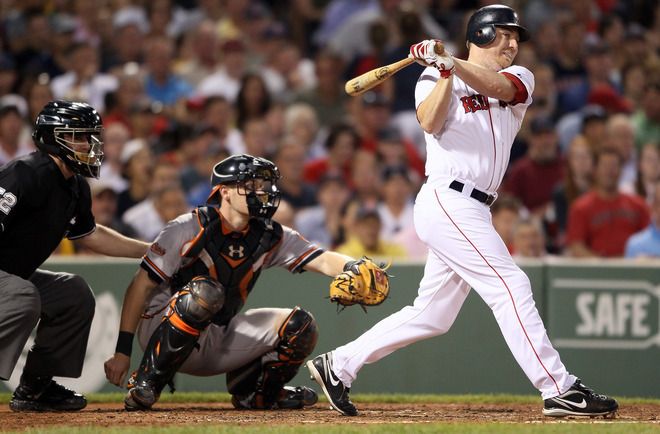 i was at fenway for a game in april of '07 when the sox hit 4 homers in a row vs the yankees. manny, drew, lowell, and varitek did it that day. now here's the amazing thing: drew had also been part of a streak of 4 home runs in a row the previous year with the dodgers. but before that it hadn't even happened once in the major leagues in 32 years! the twins had been the last team to do it in 1964. then all of a sudden j.d. drew of all people came along and did it in back to back years. in the entire history of MLB it has happened exactly 7 times. drew is obviously the only player to have done it twice (although strangely enough his brother stephen was part of a diamondbacks 4 homer streak last year). sadly, j.d. walked last night, ruining his chance to extend his record to 3 streaks of back to back to back to back home runs. i think it's unlikely anyone else will ever do it twice, 3 times would have been basically impossible. I was @ the Dodgers/Padres game when that happened. 4 solo shots in a row in the bottom of the 9th to tie the game. Nomar hit a walkoff in the 10th to win it. What a game! how awesome is this picture? come on, i need help!